I can’t tell you how much I needed this today! I have 2 scenes to write in order to finish my WIP… and I’m dragging my heels. Well, I read the title of your blog and I’m getting to work. Now. I’ll come back later to read your blog. 🙂 Thanks for the kick in the a$$. This morning I felt like I woke up and my life was a total black out, car was towed, missed work, wife wanted to know what was going on and at the time I didn’t know myself, 6 year old was demanding why I haven’t left for work yet, supervisor told me my leave was on the other side of don’t call me any more unless your dead and I still have client projects and writing to do for later…after I find out what happened to my car. Long story longer I found my car, daughter still wanted to know why I wasn’t at work, wife was still confused after I told her and borrowed her car leaving her stranded in the house as I try and focus on my writing and client projects at Starbucks. I’m sad that your scheduled blackouts are for times I’m at work, but if any are scheduled for the weekend please let me know. But I will find a way to try out my own blackouts because I still need to focus when life just ain’t having it. OMG! I hope your day improves! ((HUGS)) Actually why I am doing this blog is I hope you guys will mingle in the Main Room and do them yourselves. All you need is two or more people and a timer. I try to po in throughout the day and evenings. It is just not guaranteed. Excellent post! At the moment, I’m taking a break from editing The Vi-Purrs, which is scheduled for debut in a couple weeks + have a load of laundry in the dryer and one more in the washer … now to chase a few dust bunnies, before I put my reading glasses back on. Have a great day! I want to be spooky. Fine, it’s time I engage WANA. I have to confess. I have good days and not so good in getting off social media and into getting stuff done. 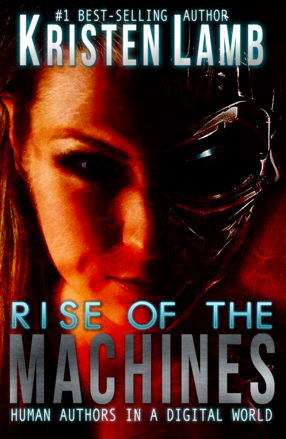 Last week I got behind doing other things because I read Rise of the Machines. Great book, highly recommend it. Who was the author again? Oh, it was you, Kristen Lamb! Criminal Minds is my vice right now. I got hooked in January and have binge-watched up to Season 7 Episode 3. My mornings are reserved for my workouts because that’s the only time I can get THAT done. LOL Evenings are hell because I’m exhausted from the day job or have to work late. Some days I can write in the evenings, some days I’m not able to, but weekends are working out for me for now. Procrastination is the worst. I’ll get on a roll with getting things done, then discover “I need to recharge” and inevitably the recharging takes way longer than it should. Guilt kicks in. Then, hey, visitors! And before you know it, another day is gone. Combine that with the feeling that the scene just doesn’t work if it isn’t showing up in technicolor in my imagination, and it’s a recipe for writer’s block. Or wanna-be-writer’s block. So good I have to share it! Thanks, Kristen! Blackouts sound great! Unfortunately 9am CST is 4am the next day hereabouts, and I am definitely not an early bird! I shall have to look into the options. I do keep a daily record of what I worked on in a small diary, and then at the end of the year crunch the numbers and post the awful truth online. But I think some accountability with a shorter turning circle would do me good. Like all of the other commenters, I have a mixed bag of results. Sometimes life gets in the way, or wait, I’m futzing around with other commitments. Only wrote new words 14 of the 29 days in February. Still, I’m formatting my most recent book to release in the next few days, have planned a 10 day marketing blitz for said book and still need to create those newsletters/meme cards/emails, am planning two major area events (book festival and fair), set up my newsletter to have a gift reward for signing up, have several personal appearances scheduled, hosting my bunco group TOMORROW and still need to clean the house, and yes, I still need to get those new words written. Oh, and as of now, I have to get my flash fiction written for my Friday blog post. Focus. Yep! I need to do that consistently. I’m circling warily around your Wana Blackout! Did I mention the rose bushes still need to be pruned back? I think I need WANA. No – I *know* I need WANA. Will it work for me in the UK? Because of timings? There are LOTS of WANAs in Europe. If nothing else our morning time works for most UK peeps. If you want to start early – meet the UK writers! 9am CST is 3pm in the afternoon for us. I’m looking forward to getting started. 9am CST is 3pm in the UK so this sounds perfect for me – I can even help out if you want to start early. Brilliant! Great post! And great points about time. One problem is that our modern world has changed how we function. We used to wake early and work hard all morning and day and then go into reflection time down to when we would sleep. Nowadays, we stay up late and even work at night. So the balance is out of whack. So we have to be even more mindful of when to do tasks. Our will is like a muscle. We have ton of will power early but lose it later. So that is when you know you will slack off. There is time. Especially the time when you are watching television. We all watch the commercials which are 3 minutes plus of nonsense. Perfect time to do something else. Or just skip the unimportant fillers for something more important. Thank you so much for the encouragement! I’ve been in an editing rut for months now and you nudged me out of it. Thank you for all you do for the writing community! This is definitely something that I needed to hear, and right on time! I’ve literally been stuck in a rut since remodeling, moving out of state and selling our home. Then we downsized into a two-bedroom apartment from a 4 bed/3ba tri-level home, and I swear it’s just been down hill ever since. I’ve never had writer’s block before, although I’m only on my third book…which was supposed to be given to my editor last month (yes, I’m that far behind!). But I would be lying if I didn’t admit that, like your post says, I’ve totally been keeping the change in the couch company. Sigh. I NEED Blackouts! I NEED WANA! Thank you so much for this post, knowing it happens to others doesn’t make me feel as bad. There should be another name for Murphy’s law specifically for writers, because whenever I get serious about it . . . need I say more! But that’s changing n.o.w. I’m joining very soon! I would have joined from today but I actually have a commission to go review an event! So obviously I have to attend the event. Who has a time turner for me to be two places at once?! I saw you in there. I would join but I have to take Sundays off or I’d be in a coma. We will be there tomorrow. So glad you are with us! It’s a neat idea, especially since I’m either programming, researching or storyboarding – when I can get myself motivate:(. An excellent blog post, written by Kristen Lamb, about “Management”… manage time, possibilities, plans, housework, writing, work, sports, relaxation – and writing again. Thank you Kristen! This post was wonderful! How do we join Blackouts? I will do whatever it takes to get this book done. Just join WANATribe and meet us in the IM Main Room field. Two people and a timer and you’re good to go 😉 . Mornings so far have been the strongest namely because I am there and lead them. I can’t do evenings because I am a morning person and I am pretty dead in the evenings, so I do jujitsu instead. Look forward to seeing you there! If you are already a member of WANATribe then we meet in the Main Room (the IM box at the bottom of your screen) every morning. Just hop in.